Londoner James Woodburn-Hall was philosophical after a Halifax debut that hardly played out according to the script. 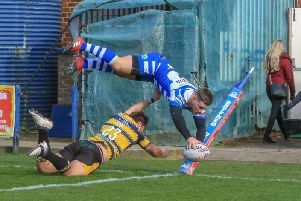 The Leeds-based sports science student, who played half back for London Broncos while he was a teenager, became the latest young player to be given an opportunity when he started at full back in last weekend’s Championship Shield fixture against Swinton at Heywood Road. But the 21 year old found himself shunted out to the wing after less than 15 minutes when Ben Heaton injured his knee and ended up on the losing side as the Lions snatched a 28-26 win in the closing minutes. “It wasn’t how you’d want your debut to go, but there were some positives to take from it and hopefully I will get the chance to build on that,” said Woodburn-Hall. “I’d been training at full back, but wing’s not an unfamiliar position for me; injuries are part of the game and you need to take it as it is and just make sure you have a good dig. “Nick turned in a great performance again - he’s scoring tries left, right and centre - but Swinton just got it at the end. “Was it a try? There was a bit of debate about that one, but the referee has given it and that’s all that counts. Woodburn-Hall, who is contracted to Fax next season, is hoping for another chance at full back against Workington at the Shay on Sunday (3.0), but with a crucial last-four showdown looming the week after, knows that coach Richard Marshall may opt for more tried-and-trusted options. “I’ve played half back and centre, but I so quite like the full back role,” he said. “It gives me the freedom and space to run at broken field, which is what I was always known for as a half back anyway. “Hopefully, I’ll get another chance there soon. “But I’ll play anywhere, any game time is good game time for me at the moment. “The reserve games have been good, giving us the chance to test ourselves against Super League opposition, but they have been a bit sporadic.